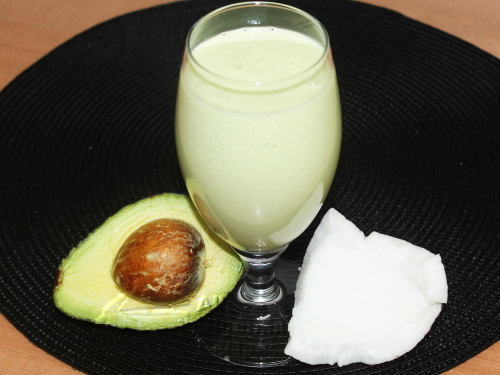 Coconut Avocado Smoothie is a simple way to enjoy avocado and coconut. It is low carb and tastes so good. I have already received feedback from Racheal that she added stevia to this and it tastes like Akamu (Pap, Ogi). You can also prepare this with Groundnut Milk (Peanut Milk), Soya Milk or Tiger Nuts Milk (Kunun Aya). The options are endless. Or you make another version: the Nourishing Avocado Smoothie. Break the coconut and use it to make Coconut Milk. For Coconut Avocado Smoothie, use as little water as possible when making the coconut milk. You should get about half a litre of coconut milk from 1 coconut. See the video below. Peel and cut up the avocado. Put the avocado in a blender. Turn on the blender and pour the coconut milk through the peep hole while the blender is running. Continue blending till you get a very smooth and well combined consistency.